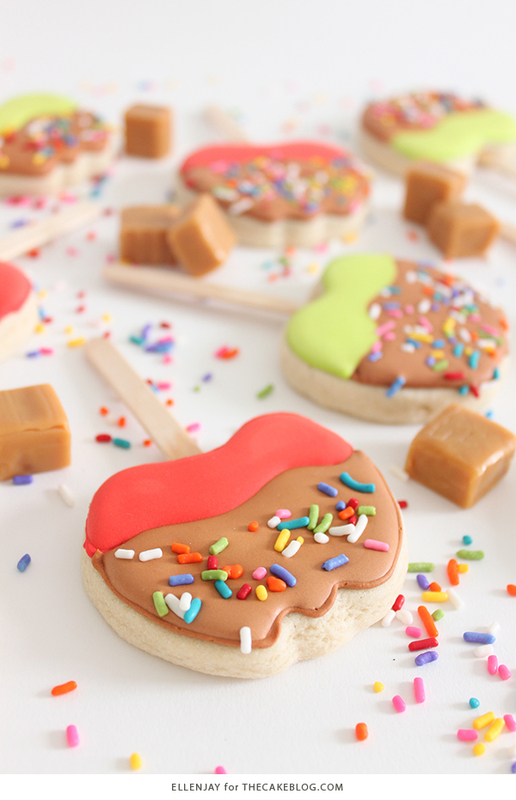 Caramel Apple Cookies – how to decorate caramel apple cookies. 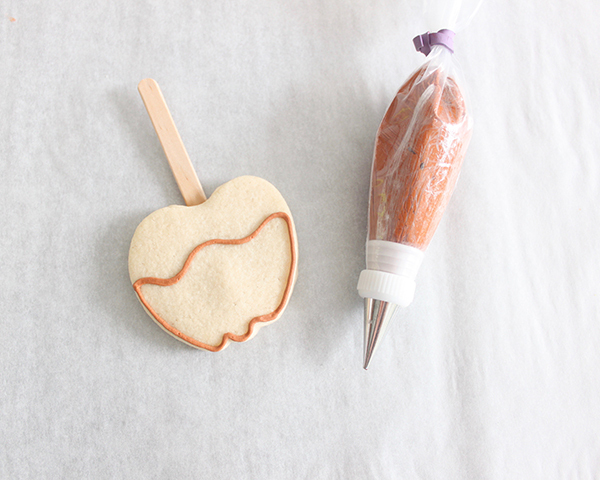 A fall sugar cookie tutorial created by our contributors, ellenJAY. Once the air turns crisp we know fall is on our doorstep and apple season is finally here! And when we think of apples we can’t help but dream of apple pie, homemade apple donuts, comforting warm apple cakes straight out of the oven with a huge scoop of ice cream and of course, caramel apples! Our caramel apple cookies are the perfect treat for fall festivals, bake sales, table place settings, trick-or-treaters or even something special to sneak into your kids lunch boxes! 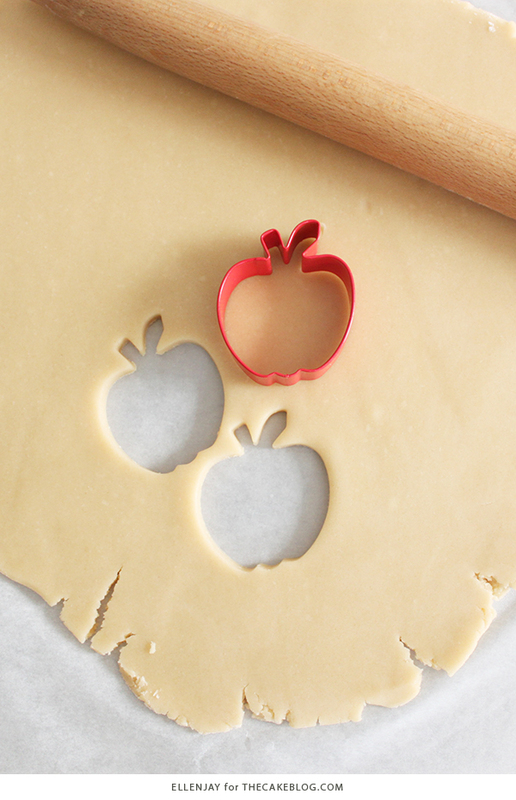 You’ll surely catch them by surprise if you swap out that crunchy apple one day with a soft and buttery decorated apple cookie! 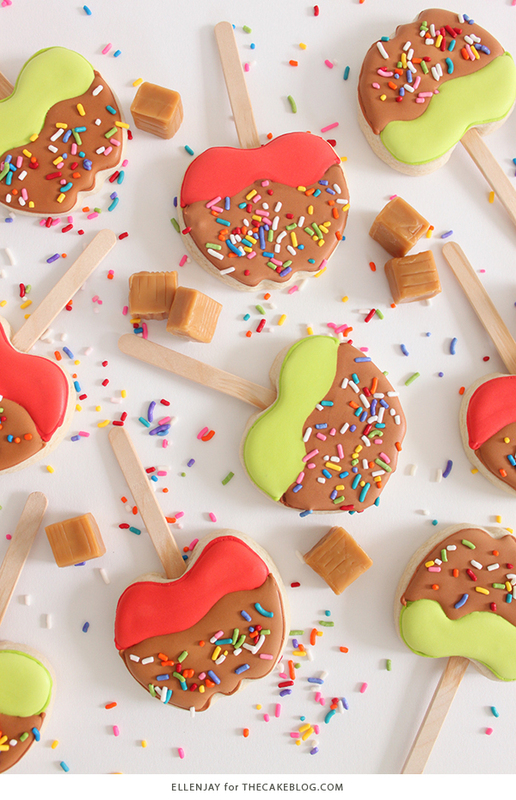 Last fall we had a caramel apple-making day at our bakery with our employees, which turned out to be a huge hit! We got the biggest apples we could find, caramel, chocolate, and all the candy and nuts you can imagine and let everyone create their own caramel apple masterpiece. Let’s just say everyone’s competitive side came out and there were some pretty unique and decadent apples that were decorated that day. Looks like we will be making this an annual bakery tradition! 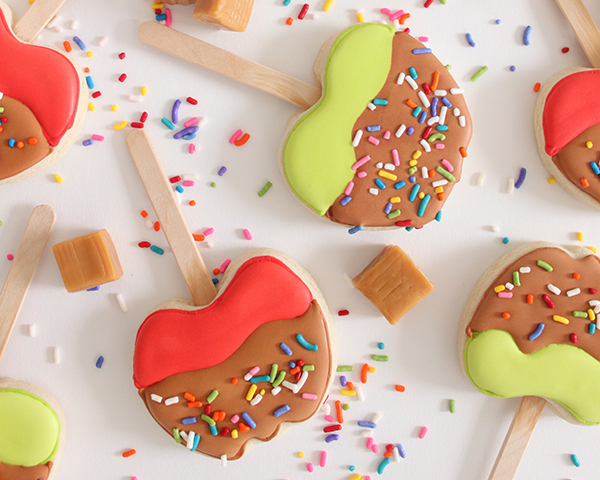 And of course we had to turn the caramel apple idea into decorated sugar cookies! 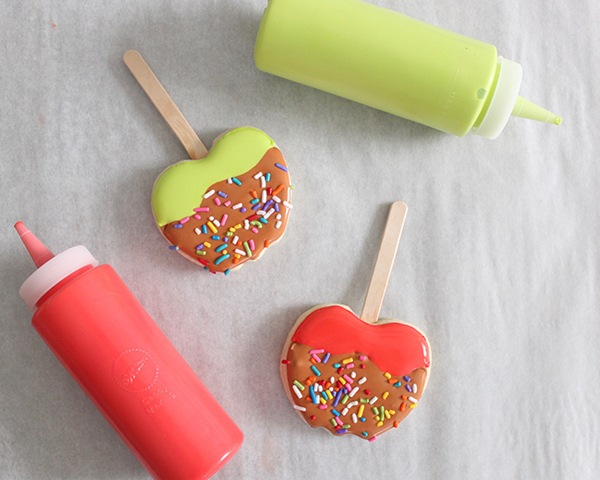 Starting with a simple apple cookie cutter and some wooden popsicle sticks, these candy delights can be decorated to look like the real thing using three icing colors (red, green and caramel) and some rainbow sprinkles! Using our go to roll-out sugar cookie dough and royal icing recipes we’ve outlined everything you’ll need to re-create these Caramel Apple Cookies from start to finish. 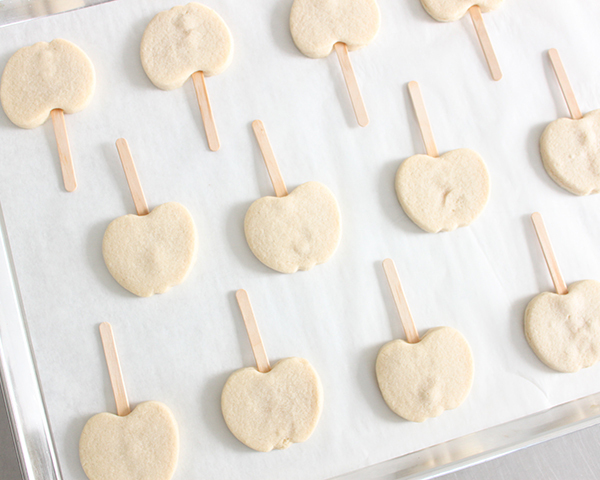 Using our favorite sugar cookie dough, cut out apples. 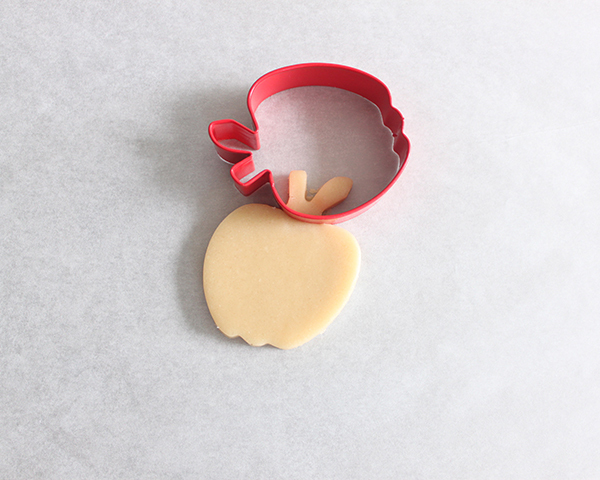 Cut the leaf and stem off the top of the apple shape using the smooth edge of the cookie cutter. 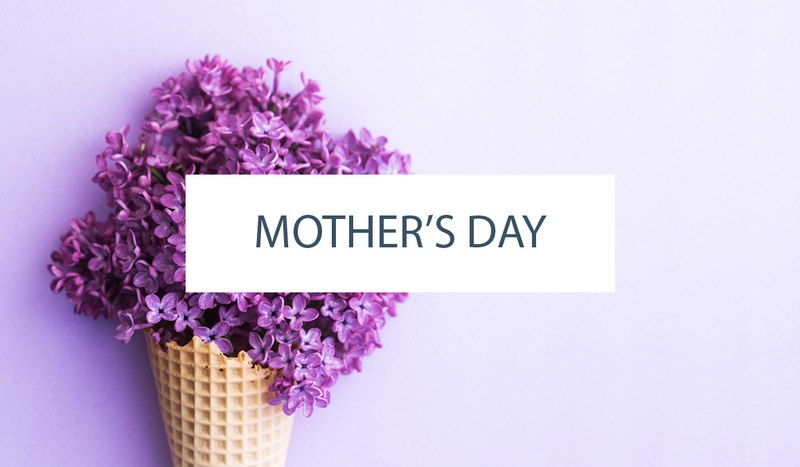 Place wooden popsicle sticks into the top of each cookie about 1 ½” deep, then place onto prepared cookie sheet about 1 inch apart. 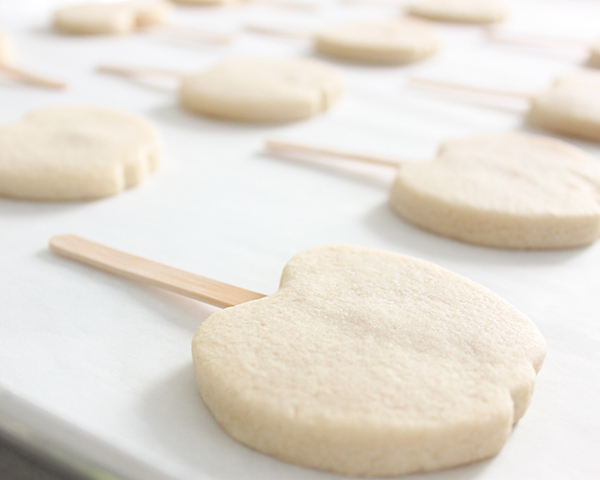 Place cookies into refrigerator for 20 minutes to chill. 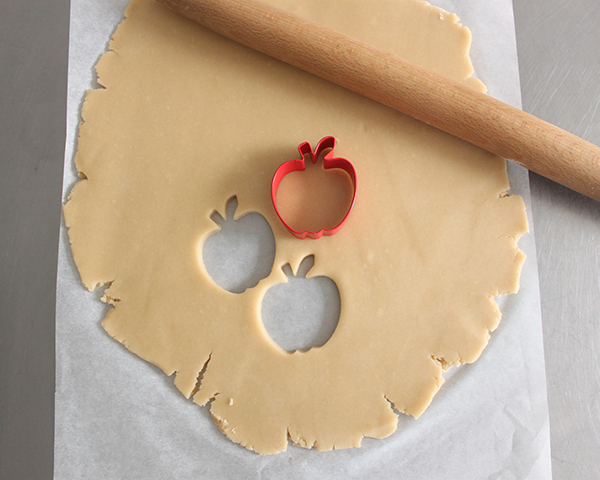 This will help the cookies keep their shape when baking. Bake for 10 – 12 minutes. While cookies are baking and cooling prepare a batch of royal icing. Portion out icing into 3 separate containers, using 1 container for each color: red, green and caramel color (made with brown, orange and yellow gel colors). Prepare piping bags with couplers, piping tips and “piping consistency” icing for red, green and caramel. Prepare flood bottles with red, green and caramel “flood consistency” icing. Flood Consistency: thin down icing with 1 teaspoon of water at a time, stir icing with small spatula and continue to add a tiny bit of water as necessary to reach desired flooding consistency. When you lift your spatula and the icing drips and falls back into itself after about 10 seconds, it is a good consistency. 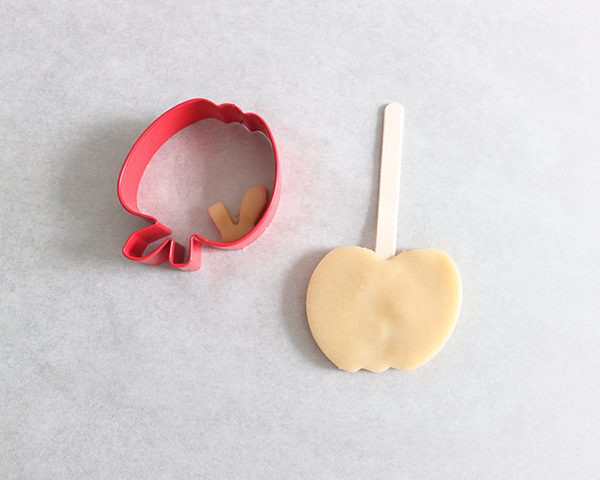 Using the caramel color piping consistency icing pipe the shape of the “caramel dipped” part of the apple on the bottom 2/3 of the cookie. 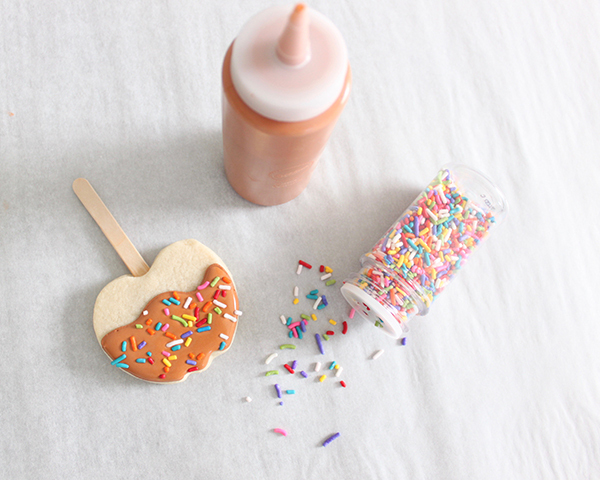 Fill in the caramel shape with the caramel flood icing from the flood bottle. 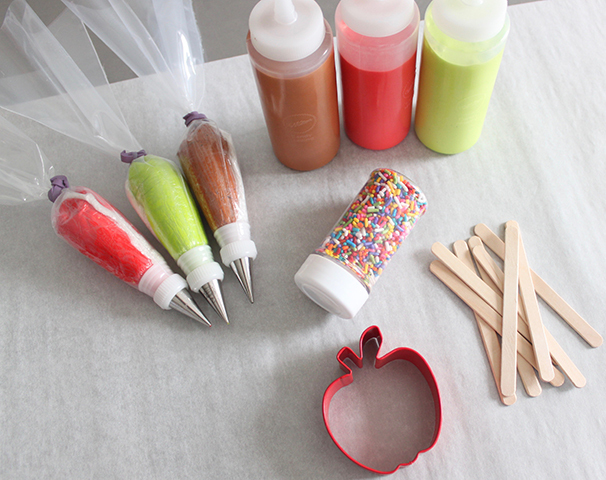 Allow icing to set for about 1-2 min and then add the rainbow jimmies overtop. You need to make sure the icing sets up a bit before you add the sprinkles so they don’t cause your cookie icing to overflow. You can typically flood about 4-8 cookies at a time and then go back and add the sprinkles all at once. 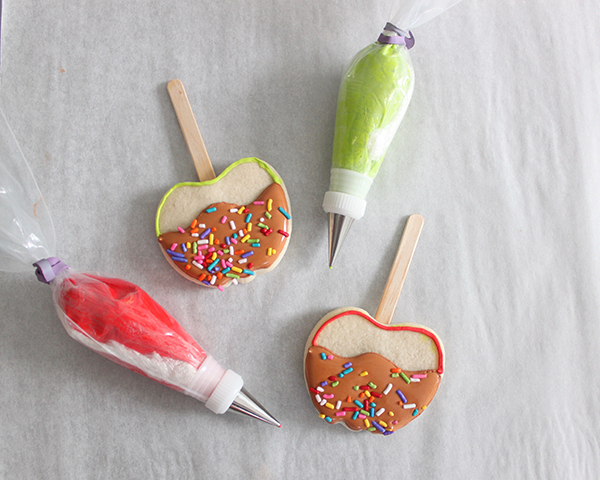 Pipe the tops of the apples with the green and red piping consistency icing (12 per color). Fill in the green and red shapes with the green and red flood icing from the flood bottles. Allow cookies to dry overnight, about 24 hours.